Most people (incorrectly) assume the moon is barren and boring. Sure, our satellite might be a little clingy, but it also has moonquakes, orange soil, and could be hiding abundant water resources. New research from satellite data offers more evidence that the Moon does indeed have water trapped in its mantle, which could be huge for companies looking to mine the Moon for resources. Still no word about where the cheese is, though. In a study published today in Nature Geoscience, researchers posit they’ve detected water within volcanic deposits spread across the lunar surface. 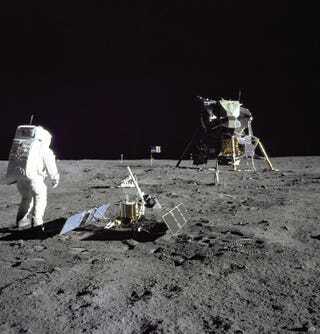 The team used measurements of lunar samples from Apollo missions, in addition to orbital spectrometer aboard India’s lost (and found) Chandrayaan-1 lunar orbiter, to investigate any signatures of water. Orbital spectrometers can measure how much light is reflected off an object’s surface and help inform scientists about its composition. The researchers detected evidence of water across many volcanic deposits, including the sites near Apollo 15 and 17 landings. In 2008, scientists detected trace amounts of water in glass beads brought back from these two Apollo sites—but this new research suggests water could be more abundant than previously imagined, and not just a thing of the past. The volcanic deposits are quite large, hinting that the Moon’s interior could hold a significant amount of water. Which begs the question of how it all got there in the first place. Private companies like Moon Express have long indicated their intent to mine the Moon for iron ore, precious metals, and water. Turning Moon water into rocket fuel could become an extremely lucrative industry—if there’s water to extract, of course.